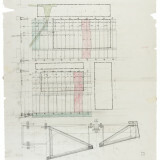 The Carnegie Museum of Art, Pittsburgh have used recently acquired drawings by Peter Salter for their current Exhibition. Growing the Collection: Architecture at CMOA features drawings, models, and photographs acquired by the Heinz Architectural Center within the past three years. The works on view relate to projects ranging across place and time: from Pittsburgh to South America, from the American Gilded Age to contemporary Japan.